It’s a small, small world, as the old song goes. And that’s increasingly obvious as events across the globe have the power to hit Americans hard at home. 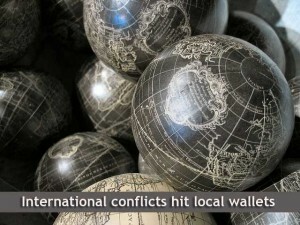 In a world that’s ever more connected, global conflicts can quickly become local ones, with consequences for the US dollar, energy reserves and consumer goods, and the economy as a whole. The ongoing Russia-Ukraine crisis offers a real time example. Many Americans would be hard-pressed to locate this former Soviet republic on a map, let alone pronounce the names of its cities and leaders. But as sabers rattle, discourse heats up and the world ponders what to do, events on the economic front are rippling quietly through the countries of Europe and across the oceans. At the heart of the battle is conflict over Ukraine’s unpopular leaders to pursue closer ties with Russia and abandon a pact with the European Union, which many Ukrainian nationalists hoped to see. Rhetoric gave way to violence, with Russia trying to assert some of its age-old aspirations for dominance over the region. One key reason; Ukraine’s rich reserves of oil and gas, and the area’s agricultural productivity, which helps feed not just Russia, but also Europe and the rest of the world. Though Russia dominated the news about the conflict, it’s not the only country with significant interests in Ukraine. The country hosts several major oil and gas pipelines that feed resources to Europe and the energy markets of the rest of the world. That could mean significantly higher prices for gas and oil in an energy-starved global community. And while Ukraine’s status as the “breadbasket of Europe” accounts for about 20% of Russia’s agricultural imports, numerous other global powers including China, the US and Canada have a substantial interest in Ukrainian products. And disruption in agricultural production and exporting from Ukraine could mean higher prices and shortfalls of some products not just in neighboring countries, but anywhere Ukrainian products are sold or used for the manufacturing of food and other goods. Travel and tourism also take a hit during conflicts – and Ukraine’s pretty Black Sea beaches and picturesque landmarks won’t see many foreign tourists for some time. That affects not just the country’s own economy but also the travel industry as a whole, forced to readjust plans and prices to accommodate the risky political situation. 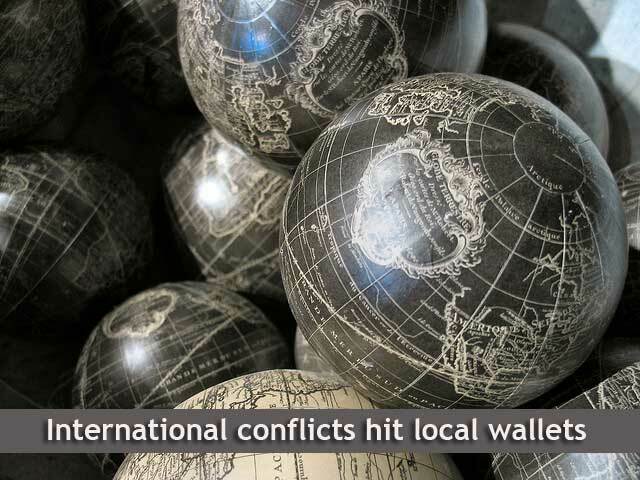 Foreign investments in real estate and other local assets can also be affected by a country’s political and economic turmoil. Foreigners with money to spend look for stability and reliability in their assets. And a shifting political and economic climate that could turn violent at any time makes investors leery of starting or continuing investments in local land and business. Loopholes in US tax laws allow companies to practice “tax inversion” – a practice of moving operations to another country with lower costs and lower wage workforce in order to avoid US corporate taxes. The practice allows American corporations to take advantage of a country’s troubled economy buy partnering with a local business, which offers a way to move all operations offshore. But serious instability in that region could compromise the US side of such a merger. And even though those companies don’t pay American corporate taxes on their earnings overseas, their US connections and subsidiaries do, in a domino effect that affects shareholders, workers and consumers at home as well as abroad. As political conflicts veer toward violence, a nation’s currency may take a tumble in world markets, losing value due to the instability. Financial experts expect the Russian ruble to take a dive in the face of world outrage and the specter of sanctions. But once a major currency falls, others scramble to regain footing, with repercussions for the values of major monies such as the US and Canadian dollars, the euro and the Chinese Yuan.